fotoQuote has been around for a long time, so we’ve had a lot of questions over the years. 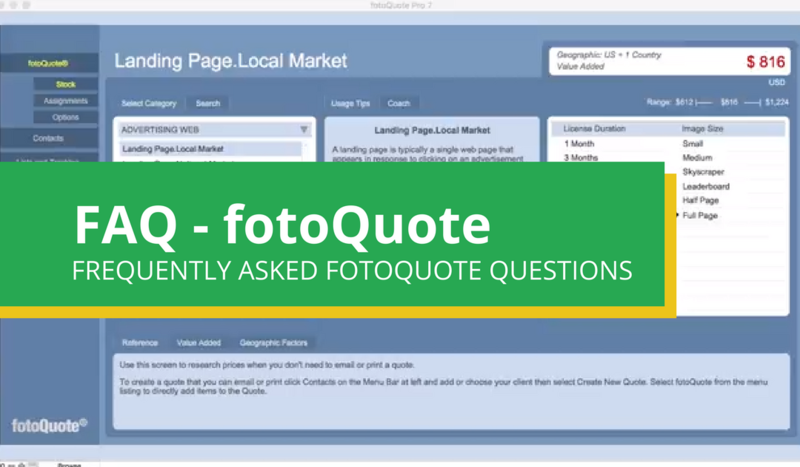 Here are some of the most frequently asked questions about fotoQuote. Unlike other sources of stock photo prices based on solely on surveys, often with unverifiable data, fotoQuote’s prices were based on actual sales records. The original 1992 prices in fotoQuote were based on research done over a 6-month period. To get accurate prices we reviewed thousands of confidential sales records from national stock agencies and photographers all across the US. We built a price grid and then checked back with experts in each category to be sure the prices were accurate. As a last step, we again checked the prices against thousands of actual sales records from agencies and photographers. Since 1993 fotoQuote has been the stock photography pricing standard in North America. Often, when we would call photographers or agencies to check on their current prices for an update we would be told, “hang on, I’ll look it up. They were looking it up in fotoQuote! For this latest version of fotoQuote we spent a year looking at every source of pricing that we could find. We spent a lot of time contacting photographers, going through the pile of notes and feedback from our customers, and scouring web sites and forums. We wanted to see what kind of problems photographers were having with pricing, and what kind of solutions were being suggested to solve them. As a result of our research, you can be feel confident you are getting the most current pricing information available anywhere! Updates are announced to our existing customers via email so be sure that we have your most current email address on file. The timing of the updates depends on the level of research required based on the types of changes occurring in the industry. Because we work within a price range in fotoQuote, we feel comfortable that the industry prices are not changing that quickly. You can also raise or lower all of the categories in the program by any percentage you wish. Our fotoQuote updates always include new features and new categories, along with pricing updates, which takes time to research. If we feel a specific category has changed drastically, we will post this information in the News and Tips sections of our website. If you are having problems getting your program running, connect with us via our support page. It is our first priority to get you up and running with your new program. If you have a pricing problem that you need help with and the program doesn’t seem to have the answer, we ask that you email us the question and we provide an email response. Your email question gives us a chance to think about your problem in advance in order to give you the best possible answer. Because our program is a compilation of data from professional photographers around the world there are some pricing problems that we won’t be able to help with because we don’t have the answers. Ultimately pricing your work is a judgment call that only you can make based on the information provided in our guide. Can I put my own prices in fotoQuote? Yes. You can change any individual price, or you can change all of the prices in the program at one time by a given percent. For instance, you can raise all of the prices in the program on January 1 by 5%. The last version of fotoQuote didn’t allow you to resize the screen, can I in the new version? Yes. In the latest version of fotoQuote Pro you now have the ability to resize the program screen. You can find these settings in the main setup screen. Is there any kind of guarantee that I will like the program? 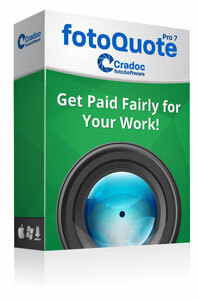 FotoQuote, like all our other programs, has always had a 30-day, unconditional, money back guarantee. What is the difference between fotoQuote and fotoBiz? Doesn’t fotoBiz have fotoQuote built-in? FotoBiz is our complete business management program for photographers. It has a customer and prospect database, invoicing, assignment estimates, delivery memos, image sales and license tracking and more. FotoQuote Pro 6 is built-in to the latest version of fotoBiz X. Many photographers keep fotoBiz on their office computer and put a standalone copy of fotoQuote on their laptop to have access to fotoQuote prices when out of the office. The standalone fotoQuote is a better solution for the laptop when you need photo pricing information at your fingertips. fotoQuote® Pro 7 is the industry standard photography pricing guide for freelance photographers, helping you determine and negotiate a fair price for your photography. 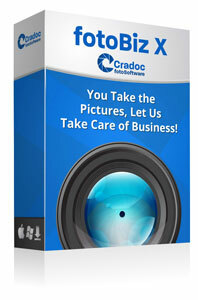 Pricing for over 360 categories of stock photos and over 70 assignment types giving you over 10,000 pricing options. It is the only pricing guide available in iOS! fotoQuote® Pro 7 is also a powerful quoting and licensing tool providing you with all that you need to bid, quote, price and protect your images. Want to invoice too? fotoBiz X is the tool you need. Try the FREE demos to see why we're the best in class! fotoQuote® Pro 7 for High Sierra & Mojave is a separate demo program. 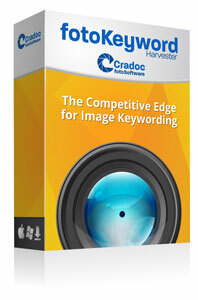 Please email support@cradocfotosoftware.com to request your demo copy now. I would like to purchase Fotoquote 7 and be able to pay for and download the software from your site. Do you only provide the software via shipping a CD? I have this same question. Is this shipped as a CD or a link online? Hi there, this is a download link.